Experience the authentic flavors of Spain with the Hot Paella catalog, bringing you everything you need to cook up a hot and tasty paella dinner. From paella pans and cookware to a classic paella recipe, treat your entire family to the time honored Spanish tradition. Paella cookware - Create a dish that savors the tastes of Spain, right in your own kitchen with a fine selection of paella cookware that will get the job done to perfection. Choose from a collection of professional paella pans in a variety of sizes, gas paella burners that are made specifically to match their premium paella pans, plus clay cookware, burner sets, legs, pan lids, spatulas and accessories that will have you cooking paella better than the pros. Paella pans - If you're planning on making paella, the proper pan is an absolute must. From restaurant grade to stainless steel, Iberian copper to traditional polished steel paella pans that will serve up to 60 steaming servings of paella, you'll be sure to find a pan that will accommodate any sized party. Choose from single pans or all-inclusive paella kits that come with cookware and ingredients combined in one convenient set! Paella ingredients - You found an exquisite paella recipe, but can't find any of the ingredients at your local supermarket. 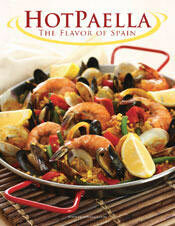 Prepare an A-plus paella every time with hard-to-find paella ingredients all stocked in the Hot Paella pantry. You'll find the finest spices including saffron, paprika and other seasonings and mixes, paella rice, Serrano ham, chorizo and sausages, olives, peppers and other mouth-watering paella making staples. Spanish foods - Besides paella rice and other flavorful ingredients, the Hot Paella catalog also supplies you with a delicious assortment of Spanish foods and delicacies. From almonds and nuts to Mallafre gourmet olive oil, you'll find Manchego cheese, Piquillo peppers, sauces and spreads, Turron candy and whole bean coffee. You'll also enjoy free paella recipes that are 100% authentic and ready-made paella dishes that are expertly prepared and ready to serve! Whether you're investing in a set of steel paella pans for your own kitchen or giving your favorite chef a professional paella kit for their next party, you'll find all of the basics in stock as well as a variety of Spanish food ingredients, paella cookbooks, cookware, festive ceramics and decor. The only thing you'll need to provide is a hearty appetite when you're cooking with Hot Paella.